Comic book fans. God bless ‘em. Somebody better bless ‘em ‘cause they most surely need it. For me to amplify on that statement we have to go back to the 1970’s. All the way back to when all there were was TV movies, cartoons and shows based on my favorite Marvel characters like The Hulk, Captain America, Dr. Strange and Spider-Man. The Dr. Strange TV movie actually wasn’t that bad but the two Captain America movies were pretty poor. The Spider-Man TV series boasted a Spider-Man that wore a belt and one webshooter on the outside of his costume. The Hulk TV series actually was very good at times and is still fondly remembered. When you mention The Hulk to the average non-comic book fan, it’s the TV show they’ll probably remember. But ever since those dismal days of Made-For-TV movies that looked they were filmed in somebody’s backyards or highly unconvincing sets with actors who clearly were doing this for the paycheck, comic book fans have been bitching, moaning and whining. They gnashed their teeth, tore at their clothing and prayed for a major superhero movie with a lavish budget for quality special effects. With an Academy Award winning director and actors who truly cared about the material and would treat it with respect. With a literate screenplay that emphasized the emotional, dramatic and psychological life of its characters and simply wasn’t punchy-punchy-run-run. And then they got HULK and they proceeded to lose their mollyfoggin’ minds. 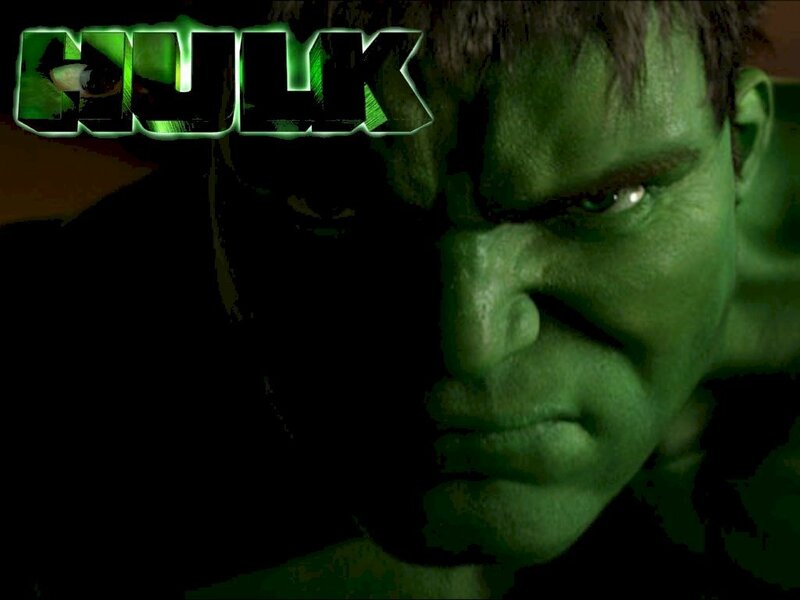 HULK is a movie that polarizes comic book fans. They either love it or hate it. The main argument against the movie I hear is that it’s “boring” which I honestly don’t understand. The Hulk isn’t your usual superhero and there are elements of the character’s backstory that deal with child and spousal abuse, alcoholism, emotional trauma, megalomania, the ethical responsibility of science and its practitioners. The Hulk isn’t about a guy who puts on a costume and goes out to beat up on the bad guys. It’s another type of character and needs to be told in another kind of way. Not that The Hulk can’t be utilized in a superhero universe. He has. It’s just that his origin story has to be faithful to the uniqueness of the character and HULK certainly is unique among superhero movies. Bruce Banner (Eric Bana) is a bionuclear researcher working on a branch of nanotechnology called ‘nanomeds’ which has medical applications. It’s a project that comes to the attention of Major Glenn Talbot (Josh Lucas). Talbot envisions armies of soldiers who can heal themselves during combat using nanomeds. Bruce isn’t interested. Mainly because he just doesn’t like the military very much and he definitely doesn’t like Talbot who is most certainly interested in not only Bruce’s research but also his co-researcher and ex-girlfriend Betty Ross (Jennifer Connelly). Betty father, General Thaddeus “Thunderbolt” Ross (Sam Elliott) is keeping an eye on all of them. Betty and her father already have a strained relationship because of Bruce as General Ross has urged her time and again to stay away from him. Turns out that in this instance, Daddy does know best. After an accident in the lab in which Bruce is exposed to a insanely high dose of gamma radiation he finds himself in times of emotional stress turning into a seven foot tall, one thousand pound green skinned man-monster driven by rage. Unknown to Bruce, his DNA has been mutated due to experiments his father David Banner (Nick Nolte) performed upon himself, those experiments uncannily similar to Bruce’s. It’s the combination of Bruce’s already mutated DNA with the gamma radiation that gives birth to The Hulk. Let me put it to you in the simplest way I can: you’re not gonna get “Hulk Smash!” in this one. There is an absolutely wonderful battle between The Hulk and the Thunderbolt Ross led forces of the United States Army in the desert that is taken right from countless Hulk comic books but The Hulk pounding the piss outta the bad guys isn’t what’s at stake here. You’ll have to wait for the Ed Norton starring “The Incredible Hulk” to get that. What we have here is a movie about two adults who have been emotionally scarred by their parents. Their true union is a struggle to heal their damaged psyches. Both Bruce and Betty are victims of the monstrous egos of their respective fathers. In Bruce’s case it causes him to turn into the living embodiment of his repressed rage. In Betty’s case it causes her to be almost uncontrollably drawn to emotionally repressed men who can never give her what she truly needs to contribute to a healthy romantic relationship. Heavy stuff for a superhero movie, huh? Sure it is. But it’s anything but boring and not every superhero movie has to be about punching out the bad guys. HULK is more about how most of us are our own bad guys. And directors of superhero movies could learn something from the astonishing visual techniques Ang Lee uses to not so much try to literally duplicate the storytelling methods of comic books but his strategy here seems to be to suggest those methods and not beat us over the head with it. It’s amazing to watch a director use the split screen technique in a way that is truly different. He uses pictures within picture, foreground and background merging with each other. That’s why I never understand those who say that HULK is boring. It’s a movie that is always moving just through the imaginative transitions from scene to the next. But bitter waters come with the sweet and as much as I like HULK I have to agree with those of you who hate the Gamma Dogs sequence. First of all; Gamma Dogs? And second, the way it’s filmed at night it’s difficult to tell what’s going on. And while Nick Nolte is one of my favorite actors I watch this movie and can’t help but wonder what movie did he think he was in. And that ending is absolutely incomprehensible. Mark Bousquet in his excellent review of HULK says that the movie should have ended when The Hulk is transformed back into Bruce by the calming presence of Betty Ross and falls into her arms. And he’s absolutely right. We get another twenty minutes of Nick Nolte ranting and raving and trying to explain to Bruce what his deal is. And there’s another nighttime fight except this one takes place in a lake where we really can’t see what the cuss is going on. This is a movie where I can’t find fault with anybody’s acting job. Sam Elliott is the definitive Thunderbolt Ross. Jennifer Connelly continues to show why she’s one of the most dependable actresses working today. I honestly don’t think I’ve ever seen her turn in a bad performance. Eric Bana makes for an interesting Bruce Banner. He doesn’t play him as a wimp or as a weakling. His Bruce Banner is a guy who has been dealt some pretty hard knocks by life ever since he was knee high to a knee and it’s taken his toll on his emotional make-up. I’ve long given up trying to get comic book fans to see HULK through my eyes. They hate it, they’re gonna hate it and I have come to terms with that. I enjoy HULK and put it on the shelf with movies such as “The Rocketeer” “The Phantom” and “Speed Racer” which most people don’t like but I feel as if the filmmakers made those movies just for me. I like to call HULK an art house superhero movie. I’ve heard various critics call it a superhero movie for people who don’t like superhero movies. Bottom line is this: HULK isn’t for everybody but I am glad it’s for me. I think you and I have to disagree on this movie Derrick. I liked the acting, I liked the use of panels within the movie to give it a more comic book feel. I liked the second half WAY more than the first. Here’s a dirty secret of mine, the only two movies I have fallen asleep in are Superman Returns and this Hulk movie. This movie commits the unpardonable sin of having the first half be slow and dull. I can appreciate it for what it is but to me the ideal Hulk movie would be a smash up of both movies. Personally, I don’t have a problem with the gamma dogs, other than the decision to use a French poodle as one of them. Beyond that, I could not agree more with this review. An outstanding review, Derrick. Truer words were never spoken about HULK than that paragraph right above the Betty/Bruce screen grab. HULK is a movie made by adults for adults and marketed to kids. I think it’s telling that both this and the Ed Norton reboot basically did the exact same box office, and so when I read comments from someone involved in this film like Avi Arad call it a disaster, I want to scream. Not all superhero movies should look and feel like carbon copies of each other; as you rightly note here, Bruce has some heavy stuff to deal with, and to Lee’s credit, the film deals with it. I think your review is truly insightful, more so than mine and I hope everybody who reads my review takes advantage of the link to read yours. And yeah, I take great delight in informing those who insist that HULK was a flop that it did exactly the same box office as “The Incredible Hulk”. The problem isn’t that the Hulk movies don’t make money. They don’t make enough money for the greedy suits who keep chasing after “Dark Knight” box office money. Not every superhero movie can make a billion dollars but I’m willing to bet that “Avengers” will. I treasure Ang Lee for making a superhero movie totally unlike any other superhero movie and being true to the complexities of The Hulk’s story and presenting it the way he wanted to present it.